SerenTripity is a dynamic travel itinerary builder I am designing. 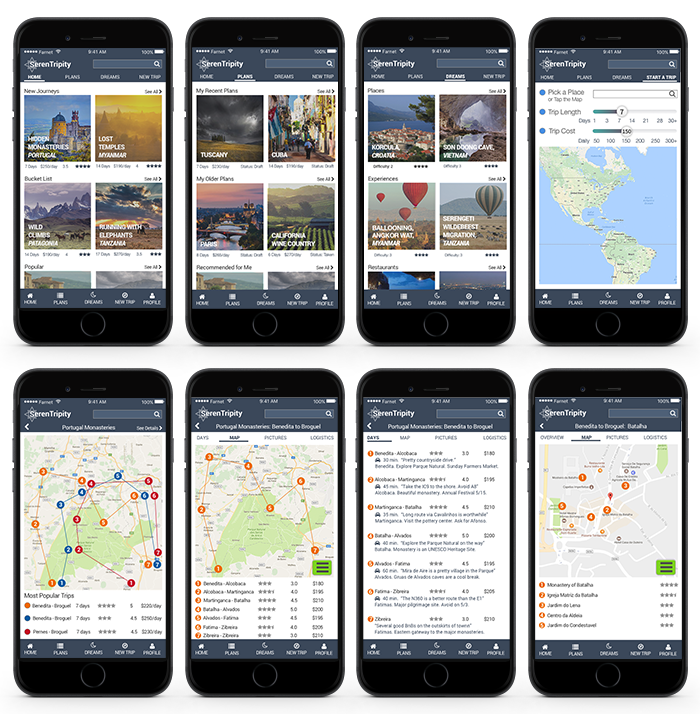 It enables Users to research, create, and flexibly follow itineraries, engaging them throughout the entire trip lifecycle. Further, SerenTripity leverages social networking and predictive analytics to create an experience for users that balances customization and the fortuitousness and discovery that travelers most often seek. With SerenTripity, users can focus more on what they do during a trip, rather than becoming absorbed with bookable logistics. The more complex and data-driven an application, the more it requires designers and developers to deeply understand Users and to imaginatively conceive flows and states. To this end, for SerenTripity I am building a comprehensive User Experience Design. This includes a multi-device UX strategy, customer journey maps, user flows, Information Architecture, interaction patterns, visual designs, and other elements. I am detailing these through a variety of media, such as the medium-fidelity mockups shown (created using Sketch), wireframes, flow diagrams, comps, and other methods. To create great experiences, a team needs to build a product around key sequences of actions and decisions Users will make. To establish, refine and communication these sequences, I often create "Task Flow Maps," such as the one shown from the SerenTripity travel application. I created this Task Flow Map using Omnigraffle. These Task Flow Maps can be purely conceptual or, as in the sample, combine conceptual elements and mini-wireframes. 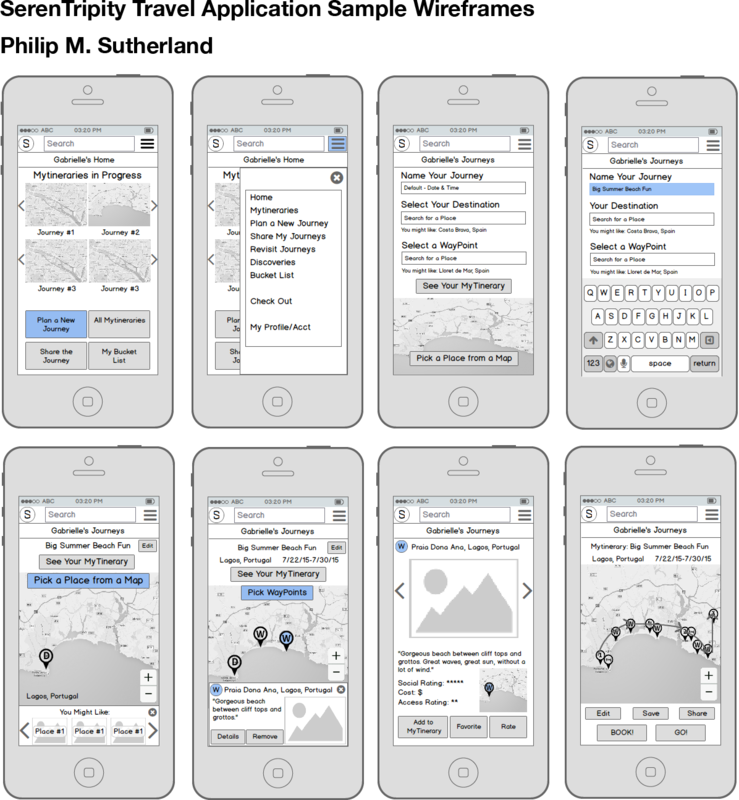 The mini-wireframes can root the flow sequences in potential key application states and views. 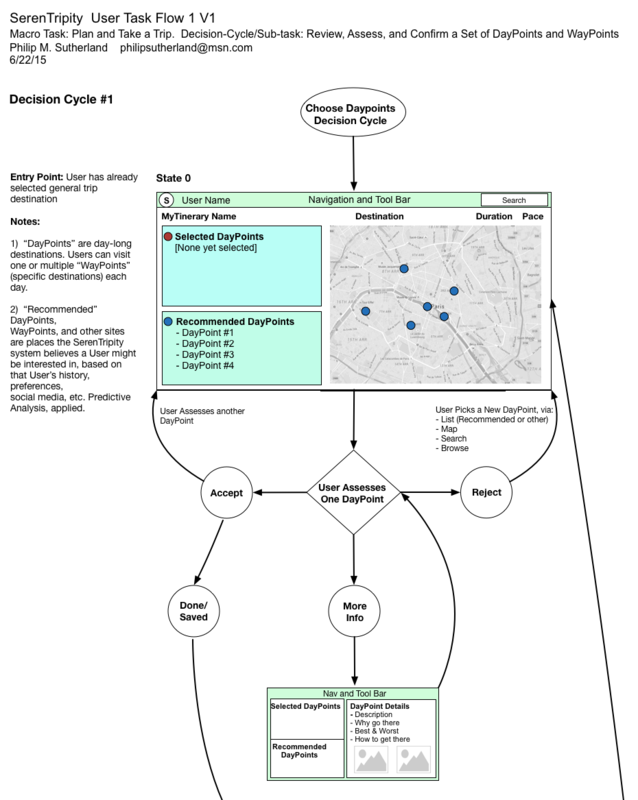 Task Flow Maps and similar lower-fidelity design deliverables are easily revised - on a good project, I may iterate a Map or sketch a dozen or more times. This assess-learn-revise cycle is generally very healthy and helps a product team make decisions early in a project without investing time and resources in higher fidelity deliverables. To help a product team understand Users (and therefore help the team create world-class products), I sometimes use deliverables such as the customer journey "map" shown. Sometimes it's more important to facilitate unifying User insights within the team than it is to build visuals or mockups or prototypes (not that these aren't critical!). Every project is different; every team is different. My goal in all cases is to help my team envision and build a great product, and I use whatever tools best enable that. 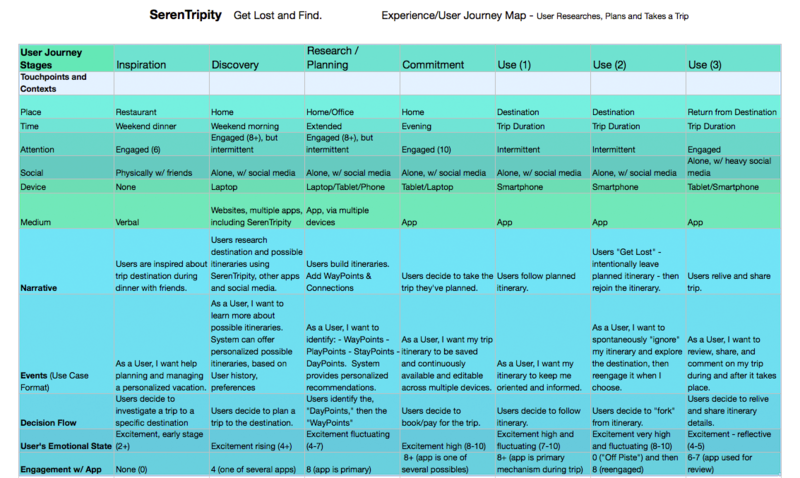 This particular customer journey map, from SerenTripity, outlines not simply primary stages a User might take in planning and taking a trip, but also notes the context in which different actions and decisions are taken. Design - especially for mobile and multi-device applications - depends on User context. See the application prototype on Invision. See a PDF file containing the full wireframe set.